Club Penguin Cheats by Mimo777 Club Penguin Cheats by Mimo777: Club Penguin Sensei-tional News! Club Penguin Time Issue #316 is here and it is all about Sensei and Card-Jitsu! Big changes will be coming to the game on November 24th! We won't have to have Sensei choose our opponents. We will just play on the mats. We will have mats in our igloos. Woot! We will be able to learn faster. Woot, woot! 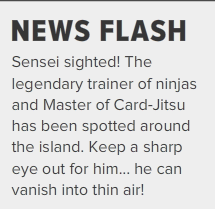 And, we can find Sensei! Triple Woot!! But, ever wonder what will happen when we complete our amulet? "Many Amulets may become a storm." Saweet! A storm is just what we have been looking for!! Ok, enough about Sensie, Pufflescape has drawn lots of penguins to the Pet Shop to earn lots of stamps! Do you have all the Pufflescape stamps? 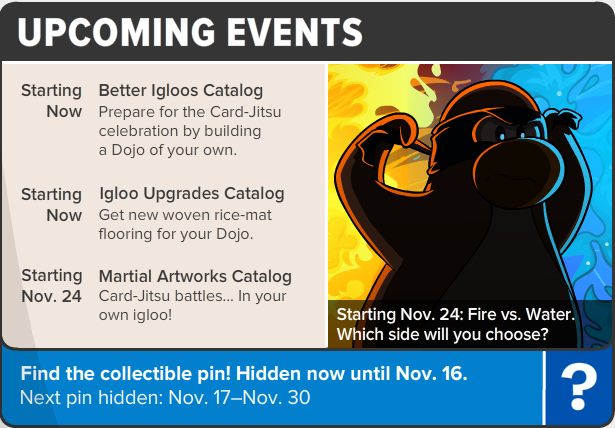 I think the grand thing will be having Card-Jitsu Shadow/ Dark. hey, where it says fire vs water, wont it be obvious that water beats fire?! I'm going for team water, beause it's blue and I'n on team blue. wait mimo! remember when happy77 was wearing this gray ninja suit? 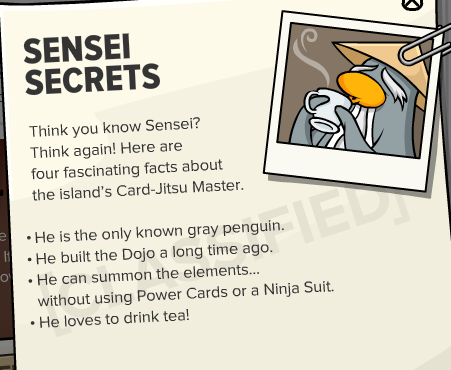 well sensei said that something grand may happen when everybody masters card jitsu. 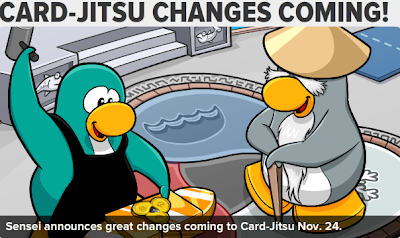 IT HAS SOMETHING TO DO WITH A NEW TYPE OF CARD JITSU!